We printed 66,349 individual covers of Maclean's magazine for Remembrance Day — each bearing the name of a Canadian serviceman and woman who died in WWI. Plus one for the unknown soldier. My wife was cleaning her mom's house and today she discovered that her grand uncle James Hambleton (he was 30) died of his wounds while fighting in the battle of the Canal du Nord as a private in the Manitoba Regiment, 16th Infantry Battalion, 4th Canadian Division on September 30, 1918 near Blecourt. The objective was Cuvillier. He was declared MIA on Oct 1, 1918. It appears he and others were taken as a POWs and he died some time thereafter as the Red Cross in Geneva forwarded a German list of allied casualties with his name was on it. He is buried in the Denain Communal Cemetery. 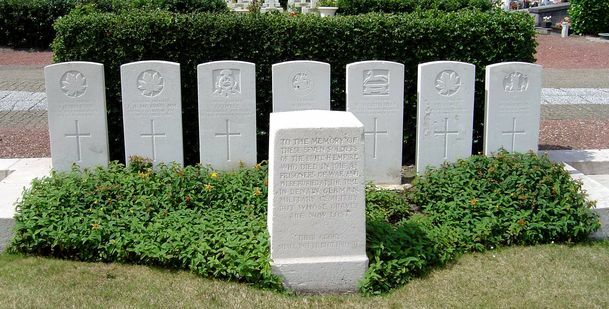 and were buried at the time in Denain German Military Cemetery but whose graves are now lost. L. to R.: J. Hambleton - J. A. McInnis - J. Covell - A. Moss - W. J. Crutchley - P. H. Cooke - W. Anderson.